How do I use a baking stone? A baking stone is a large, usually thick, piece of stoneware that is often recommended for bread and pizza baking. The instructions usually say to put them on the bottom or middle rack of your oven, then preheat it for an extra-long time before baking. Using a stone is said to improve the crust of both bread and pizza, but often little explanation is given as to why this is the case. The way that baking stones work is simple. Baking stones absorb and retain heat very well, so when you put them in the oven and allow the oven to run for a while, the stones heat up. They transfer heat directly to the bottom of your bread or other baked good, as baked goods can be placed directly on the stone (or on parchment, then on the stone) so the bread never starts out on a cold surface, as it would when baked on a baking sheet. This allows bread to bake more evenly all over, resulting in a much nicer crust – particularly for artisan-type breads.Â Since the stones retain so much heat, they also help keep the oven at a much more even temperature and make up for some of the heat that is lost when you open the door to put something in. You can leave your baking stone in the oven when you’re not using it, especially if it’s on the bottom of your oven. If it’s on a rack, however, you may want to remove it when baking cakes and cookies. 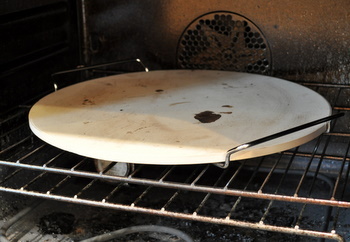 The extra heat from the baking stone directly underneath (say, if you’re setting a baking sheet right on the stone) can cause cakes to cook faster and cookies to overbrown on the bottom, so keep that in mind if you do decide to do your regular baking with the baking stone in your oven. You can buy baking stones at many specialty grocers and kitchen stores, as well as online. I often see unfinished quarry tiles recommended as inexpensive alternatives to commercial baking stones, although an unfinished tile is a bit more likely to become brittle and break-able over time. The thickness of the tile should not have an impact on the results, so choose a stone that fits in your oven well and is light enough that you can handle it easily. And when they get filthy, just leave them in the oven when you do an oven cleaning cycle, you will be amazed. Any recommendations for those of us who might need to clean a baking stone that was left out in a garage unpackaged (and who lack the aforementioned oven cleaning cycle)? Are you supposed to put them in the oven on that wire carrier they give you? I did so, and then when I went to lift it out, it melted thru my (albeit) cheap oven mitts. From then on, I just left the stone by itself on the bottom shelf of my oven, and I never take it out. I never knew what to do with that wire carrier. And yes, the oven cleaning cycle leaves it like new. I’m making a flat bread as we speak and was just thinking about how I reallyyy need a baking stone! I use hot water, a good scrubber and let the stone take a run in a very hot oven for an hour or two. I don’t use soap, because the stones are porous and I don’t want any residue trapped inside. Bruce – I leave the stone in the oven until it has cooled completely before taking it out, and just remove my bread with a bread peel or by sliding it onto a baking sheet with a big spatula. I must say I like the PC stone far better than any other baking device I have had. PC has a wide variety of stone items. I am not a PC dealer/salesperson. I am however a PC customer for life. I could go on and on. I use a large garden paver as a baking stone. It works wonderfully and at $3 I won’t be upset if it does eventually crack. I’ve been using it for years though without any problem. Thanks for clearing up this subject. I’ve heard differing opinions, so it’s great to hear everyone’s input! Could I use my stone baking tile in my microwave? Hi Betty – I wouldn’t, as it really isn’t intended for use in the microwave.